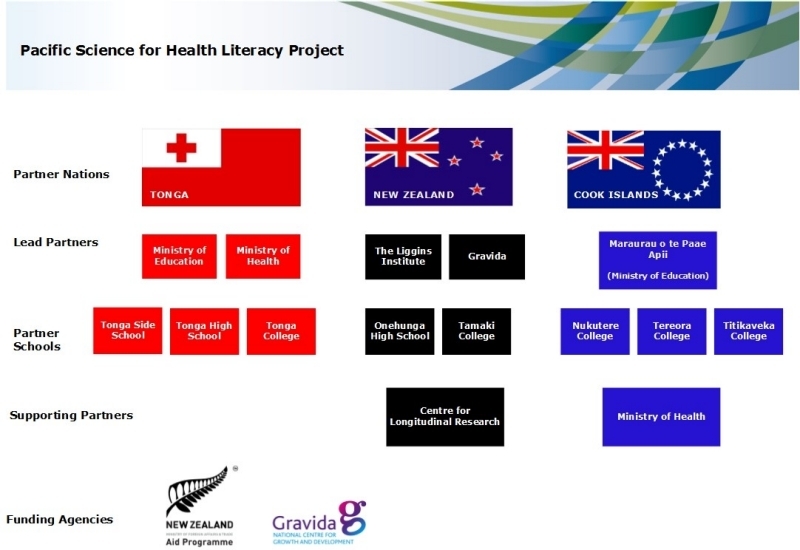 The Pacific Science for Health Literacy Project is a partnership between education, health and science communities in New Zealand, the Cook Islands and Tonga. Educators, scientists and health professionals from the University of Auckland and key partner schools. Educators, health professionals and scientists based in Rarotonga represent the Cook Islands in the project. Educators, health professionals and scientists based in Tongatapu represent Tonga in the project. Lead partners: The Liggins Institute, University of Auckland and Gravida: National Centre for Growth and Development. Supporting Partner: The Centre for Longitudinal Research, University of Auckland.